Pakistanis Worldwide Celebrate 72nd National Independence Day With National Fervour and Zest! 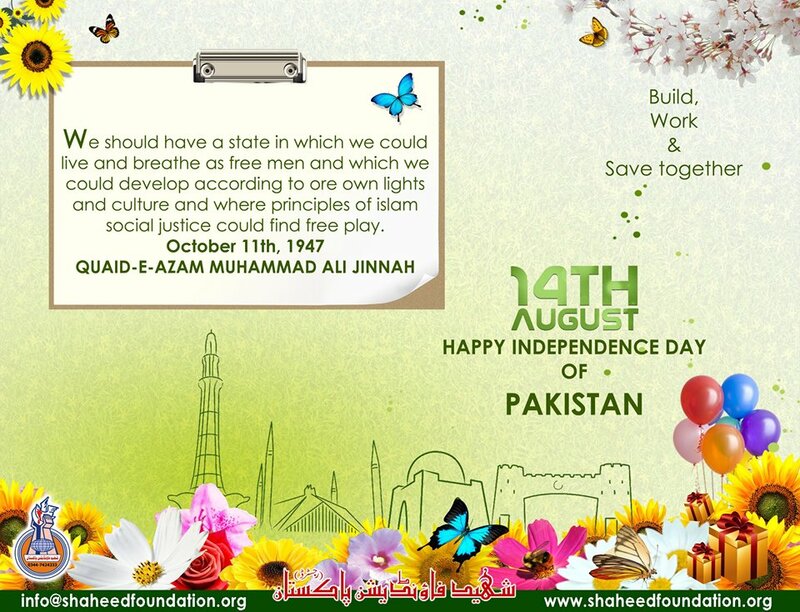 Pakistanis worldwide celebrates 72nd national Independence Day with national pride and zest. On this day in 1947, the subcontinental Muslims, won for themselves a separate home-land under the able guidance of the visionary founding father of Pakistan Quaid-e-Azam Mohammad Ali Jinnah. The dreams of the founding leaders of Pakistan Allama Iqbal, Quaid-e-Azam Mohammad Ali Jinnah, Mohtarma Fatima Jinnah and all the scholarly politicians who had a strong idea of contemporary politics then, was to make Pakistan a bastion of peace, tranquility, religious co-existence and brotherhood as is manifested in Quaid-e-Azam's address to the constituent assembly on 11th August 1947. It was unfortunate that later generations could not shoulder the responsibilities as a nation for making rapid progress towards fully capitalizing on the vast potentials of this vibrant nation .This led us to brink of several challenges often and severe national losses, which is too painful a memory for a joyous occasion. Great nation however must always focus on introspection and self-improvement as a lax or laid-back approach on this count always costs dearly, as can be witnessed in the histories of many nations around the globe. There have been strong glimmers of hope through these decades of our existence ,amid turmoils and challenges, in a range of factors and positives which kept our heads high as Proud Pakistanis and we need to build on positives furthermore. Pakistan's increasing focus on building strong regional ties and harnessing the potential of one belt one road with immense economic benefits is also a welcome sign, which if skillfully managed can indeed be a game changer for the entire region. After all those years when one always woke up to sad news of a terrorist incident here or there, the tremendous victories of Pakistani nation against terrorism in recent years indeed deserve a salute. Pakistanis from all walks of life, some 90,000 of them according to modest estimates lost their lives to terrorism and as we celebrate our national Independence Day we must remember all our martyrs. It is time especially to also pay tribute to the martyrs who have laid down their lives fighting against terrorists in these recent years as many gallant youthful officers and jawans from our armed forces and civil law enforcement agencies have sacrificed their lives for the future of our generations especially in these last four years because of whose sacrifices Pakistan nation is observing our Independence Day in relative calm and peace. It is time for our national think tanks and newly formed government to formulate policies which can enable our nation to consolidate our gains made yet and do a dis-passionate analysis of historic events to avoid a repeat of any follies at national policy making level. Concerted efforts on educating our youth and children should be a core focus and priority as that is the only way de-radicalization of our society is possible and the menace of terrorism can be effectively defeated and rooted out in the longer run. Conscious efforts must be employed by educational institutions and elders to teach peaceful co-existence to our youth and children. According to National Human Development index report nearly 64 percent Pakistani population comprises of youth /children below the age of 30 which means a lot of focus of our nation should be on creating positive opportunities, to develop the best human resources which can be crucial to a knowledge based economy, which we can very easily become with the kind of talented youth Pakistan possesses. As Pakistan nation continues to make celebrations let's not forget the families of martyrs and all the oppressed of the world. With the electoral process recently concluded and new government being sworn in, it is wished, hoped and prayed that all the changes augur well for the future of Pakistani nation.